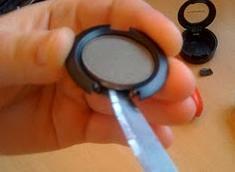 When you open your eyeshadow, you will notice a little gap between the two parts of the container. Stick the knife carefully into this gap and wiggle it about, until they click apart. Once that happens, remove the bottom part of the container, and keep it - you can exchange this in the Back2Mac scheme! 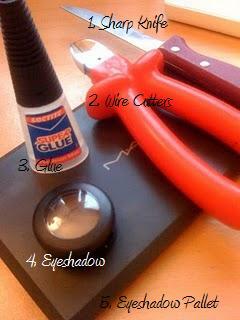 Taking the wire cutters, snip the eye shadow case at both sides of the opening... but be careful, you don't want to crack the eyeshadow! Once you have cut both sides of the opening, bend the flappy part back, and (if possible) remove it altogether. 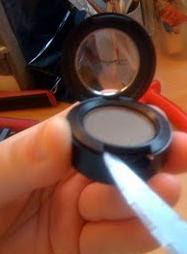 Slide the knife, carefully, into the gap that you have created, between the eyeshadow and the case. 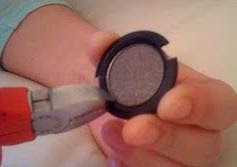 Wriggle it about, and loosen the eyeshadow (which is glued in place!!) 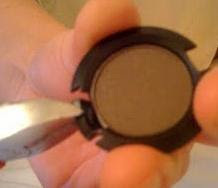 Again, be very careful that you don't crack the eyeshadow. Hope this helped some (or all) of you... I love making pallets - any excuse to buy eyeshadow! !